The theme selected for week one-sixty-seven of Operation Graphite will be, Fury Road. Of all the summer movies I am looking forward to, Fury Road is not only the film I’m most looking forward to, it is also one of the few that don’t preach about the dangers of artificial intelligence. Seriously, it’s like robot hatred summer. Even Jurassic World’s big bad is an artificially intelligent mega dinosaur. 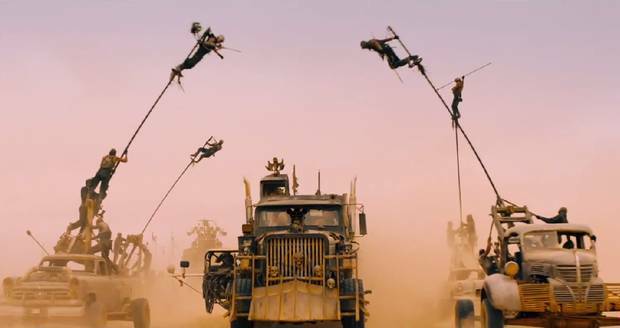 Mad Max: Fury Road, looks insane, and totally in a good way. George Miller, who gave us the original Mad Max films is directing this reboot. That alone is a reason to not scoff at yet another reboot/remake, but the trailers look incredible too. The action looks amazing, and hopefully this will be another minimal, yet artful action film like the Road Warrior was. Please submit any drawing or painting, using traditional or digital media, that fits the theme: Fury Road.